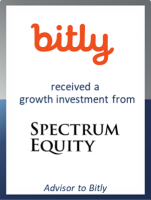 GCA acted as exclusive financial advisor to Bitly Inc., the world’s first link management platform, on its $63 million investment from Spectrum Equity, a leading growth equity firm. This marks GCA’s 33rd transaction in the Technology and Media, Digital Media & Communications sectors since the start of 2017. Businesses use Bitly’s intelligent links to gain greater transparency, control and data ownership across diverse and fragmented user experiences. This partnership with Spectrum, experienced builders of SaaS companies like Ancestry.com, SurveyMonkey, Lucid Software, and lynda.com, will help the company expand its link management capabilities from its strong foothold in enterprise marketing to an increasingly diverse set of customers and teams. Mark Josephson, CEO of Bitly, said: "This deal with Spectrum underscores Bitly’s emergence as the leader of link management, a new category that connects the customer experience and insights across product lines and departments. We see a future where companies have more brand visibility in every channel, real time data access, and control over the customer journey because they have made link management a central part of all business units." John Lambros, Managing Director and Head of Digital Media at GCA, commented: "GCA has been active in the software and advertising/marketing technology sectors for over a decade. We have witnessed a dramatic increase in the use of data for brands, marketers and publishers as we enter the era of people-based marketing. The real-time analysis and utilization of first party data is central to this, and Bitly occupies a vital position at this important crossroads."